O'Byrnes Beverage house - Doing things differently. Yesterday evening I popped in to O'Byrnes to see how it is getting on. The manager, Bernard contacted me a few weeks back through this blog to let me know. I was supposed to meet up with him a few weeks back but due to unforeseen circumstances that did not happen and I went to Against the Grain instead, although I intended to go there anyway. As it turns out, the landlord of O'byrnes is the same as Against the grain and Oslo. It was the Halloween Saturday night, Halloween is tonight so falling on a Sunday means last night would be a better party night. This weekend O'Byrnes put on a sort of Halloween beer festival. 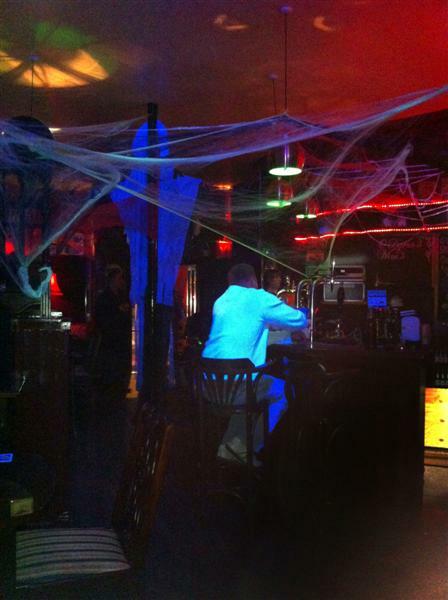 Bernard can be seen behind the bar in the picture above. He is a great guy trying to make a go of what in my opinion is a great pub. Bernard prides himself on "Doing things differently" and this really shows. For starters he is mixing Irish craft beer in the form of Hilden beers with Eastern European beers in the form of Svyturys. These are just the tap beers because there is also a good collection of bottled beer from around the world, namely the US with the likes of beers from Speakeasy (including big daddy) and Mendocino as well as others. So this is not just another pub serving the same boring beers that all other Irish pubs serve, although they are available if that is to your taste (or lack there of). Perhaps the most interesting aspect of last nights visit was the discovery that they now have a Cask engine serving Headless Dog. This makes it one of only three pubs in Dublin that serve Cask beer that I can think of. Bull & Castle, Porterhouse (a few locations) and now O'Byrnes. Now the cask is really only a temporary addition and will probably not be a permanent feature but it would be fantastic if Bernard can make it permanent. In the end it will be all down to promoting the cask beer as the traditional method of serving beer, which will tie in nicely with the fact that there is often a Traditional Irish session at the pub. If enough drinkers start drinking cask beer to make it economically viable then that would certainly be doing things differently. I knew nothing about the special Halloween night before I arrived so I was pleasantly surprised by how well the place was decorated. There were impeccably costumed staff as well. Perhaps the most interesting feature was that the music and TV's were synced to a special digital Halloween presentation that they put together combining clips of popular horror movies with random Halloween style music. The result was a very atmospheric and entertaining experience so well done to the team. I would have loved to stay all night but unfortunately I could not. I had to take my wife to dinner and then home as she had to work the next morning. O'Byrnes was serving light bites and I did get a delightful cheese and fruit plate to keep me going. There was also a special party from Yelp there last night as well as a rep from Lituanica who import/distribute Svyturys. O'Byrnes is located at the corner of Capel street and Bolton street. It used to be the gaudy Booze2go (see google street view below) and previously the Four Seasons Inn. Thanks for the info on this spot, called in on Sunday evening for a quick one and was quite impressed. Great value on the bottled beers, especially the Speakeasy and Mendocino brews, €4 each, nice! The Tale Of The Ale: O'Byrnes Beverage house - Doing things differently.